At least 12 people have been killed in a suicide bombing at a busy checkpoint in the central Afghan province of Panjshir, a spokesman for the provincial governor has told the BBC. In a statement to the BBC's Mahfouz Zubaide, he said that the bomber blew himself up near the provincial border, injuring more than 35 people. The Taliban in a text message said that they carried out the attack. Officials say that the number of casualties is likely to go up. Interior Ministry spokesman Sediq Sediqqi told the Reuters news agency that six policemen and six road construction workers were killed when the bomber struck at a highly-guarded checkpoint where vehicles enter the Panjshir valley. Police say that a number of security force members and civilians are among the wounded. Correspondents say that Panjshir is a mountainous province which served as an important rallying area for fiercely anti-Taliban forces as US-led forces toppled the Islamist group's government in late 2001. It has been relatively stable since the militants were ousted. 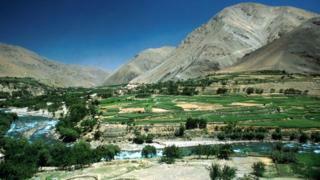 The steep valley in the Hindu Kush mountain range is also famous for the dogged resistance of its inhabitants against the Soviet occupation of the 1980s. The Taliban pledged to disrupt a presidential election on 5 April and mounted a series of attacks in the run-up to the poll but voting on the day went ahead largely peacefully.